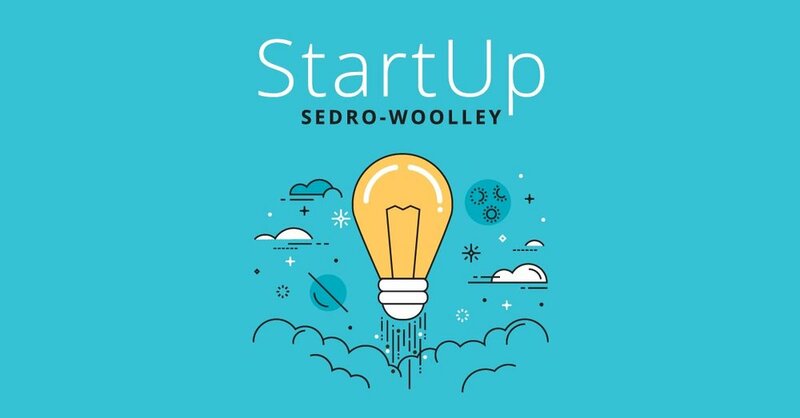 StartUp Sedro-Woolley is a pilot program for aspiring entrepreneurs featuring free business training and support, cash prizes and the chance for participants to launch a pop-up business at a new business park. Up to 20 emerging entrepreneurs, including up to three high school students, will have the opportunity to participate in CIE’s First Steps to Business course, a 16-hour course that will be held twice a week (Tuesdays and Thursdays from 4-6pm) starting May 6 through May 30 at the Skagit Connection Hub. Participants will learn how to apply business fundamentals to assess the feasibility of their business goals to reach a quick “go-no go” decision. Participants will have access to individualized coaching and mentorship from the Center for Inclusive Entrepreneurship, GroWashington, the SBDC, and local volunteer business and economic development professionals. Participants who complete the course will present their business proposals to a panel of local experts. The five top proposals will be awarded $500 to help with basic start-up costs, such as licensing, business cards and other simple items. The grand prize winner will be awarded the opportunity to launch their business in the new business park planned for downtown Sedro-Woolley. First Steps to Business Course: Free business training that will help you apply business fundamentals to assess the feasibility of your business goals and reach a quick go-no go decision. Business Coaching: Individualized one-on-one business coaching from CIE, GroWashington, SBDC business advisors, and volunteer mentors. Seed Funding: A chance to win a $500 seed grants to help with startup expenses (5 winners). Shop Space: A chance to set up shop at the DTA business park (1 winner). StartUp Sedro-Woolley culminates at the end of May with a competition as participants present their business feasibility plans to a panel of local experts. The five participants with the best plans will be awarded $500 to help with basic start-up costs, such as licensing, business cards and other simple items. The grand prize winner will be awarded the opportunity to launch a new business at a pop-up kiosk at a new business park planned for downtown Sedro-Woolley. Funding for StartUp Sedro-Woolley was secured by CIE through a $15,000 grant provided by the Washington State Microenterprise Association, and through a $5,000 match by the Sedro-Woolley Downtown Association. What makes you a good candidate for Startup Sedro-Woolley? What are your long term goals for your business? Eligibility: The competition prioritizes new or early stage independent and locally-owned businesses that can be launched with less than $50,000 in financing. New products or services from an existing small, independent, and locally-owned business may be considered. Generally, non-profits are not eligible unless structured as a social enterprise to be substantially self-financed by operating revenue. The proposed new business or new products or services must have a significant operational presence in Sedro-Woolley. Application: All participants must submit a completed StartUp Sedro-Woolley Application by April 30. The application is available online at www.bit.ly/startupSW (see “Submission Guidelines” below). The StartUp Sedro-Woolley partners will review the applications to determine eligibility. Up to 20 eligible applicants will be invited to advance in the competition by registering for the First Steps to Business Course. Business Feasibility Plan: Participants will be required to participate in the First Steps to Business Course, submit a written Business Feasibility Plan to the judging panel (see “Submission Guidelines” below), and attend a celebration and award ceremony on Saturday, June 6 (time and location to be determined), where the awards will be announced. The First Steps to Business Course will be held in Sedro-Woolley in May. This 16-hour course will be held on Tuesdays and Thursdays from 4-6pm, May 7-30. The Business Feasibility Plans consist of the completed First Steps to Business assignments. Judging Process: The StartUp Sedro-Woolley partners will appoint an independent panel of judges with deep local knowledge and expertise in entrepreneurship, business startups, business management, and sustainability. Business Feasibility Plans will be judged based on completeness, whether the business goals are realistic and achievable, and whether the business would be a good fit for the Sedro-Woolley Downtown Association’s new business park. The judging criteria are attached. Awards: Up to five (5) top scoring participants will receive a startup seed grant of up to $500. The participant with the highest score will be offered an opportunity to launch a new business in one of the kiosks at Sedro-Woolley Downtown Association’s new business park. The startup seed grants may only be used for the purposes identified in the Business Feasibility Plans of the selected participants. Completed Business Feasibility Plans must be delivered in person to Ian Larsen at Liberty Bistro located at 707 Metcalf Street, Sedro-Woolley, WA 98284. The deadline for submissions is 5:00 p.m. on Friday, May 31. No late submission will be accepted for purposes of the competition. While the competition organizers and judges are bound by ethical considerations to keep information confidential, neither the organizers nor the judges will sign non-disclosure agreements with any of the participants as part of the competition process. The organizers reserve the right to use in publicizing the competition the name of the participant, the name and brief description of the business provided on the StartUp Sedro-Woolly application (subject to confidentiality of proprietary information), and any photographs taken during the competition. Participation in this competition gives participants no guarantees, expressed or implied, to any awards or to any potential or future funding. Copies of the StartUp Sedro-Woolley Application, the Business Feasibility Plans, or any other materials submitted to the competition will not be returned. Participants agree that the competition organizers are not liable for any direct or indirect damages, including any loss of revenue that may or may not be related to business advice received in conjunction with the competition. The competition organizers reserve the right to disqualify, in their sole and absolute discretion, any participant from the competition at any time (before or after a judging round or the award of any prize) for any reason. Reasons for disqualification may include, but are not limited to, plagiarism and any other form of dishonesty, misappropriation or infringement of the intellectual property of others, and any failure to comply with these rules and regulations. Disqualified participants shall forfeit all prizes awarded to them. The competition organizers reserve the right to amend or change StartUp Sedro-Woolley or any part of the competition or these rules and guidelines at any time for any reason. Mike Skinner, Center for Inclusive Entrepreneurship, 220 Second Avenue South #126, Seattle, WA 98104, mike.skinner@cie-nw.org, (206) 235-6029.